Even though I try not to spend with reckless abandon, I’m still a sucker for smart home technology. When I was at FinCon last month, I managed to win an Amazon Echo Dot and have had that thing sitting on my shelf for the past month. It’s pretty cool. The thing I really wanted, though, was a Google Home Mini. It fits better in my smart home ecosystem and I’m more of a fan of Google stuff anyway. Still, it’s not something that I’d be willing to spend $50 or even $25 on. I’m way too cheap for that. 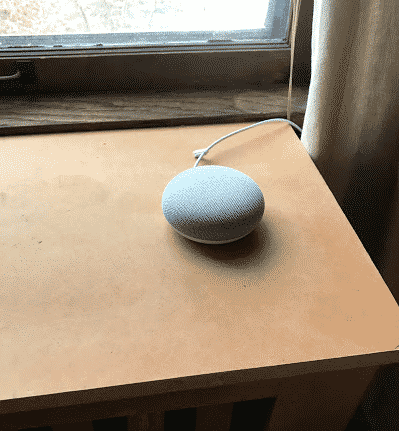 The other day, however, I was browsing Doctor of Credit and saw that, with a little bit of scheming, it was possible to get a Google Home Mini for just $5. Five bucks for a Google Home Mini? Now that’s something I can do! Today, I wanted to share with you this deal that I found on Doctor of Credit (in case you missed it) and explain how you can get in on this too. If you follow the steps outlined in this post, you’ll be able to get a Google Home Mini for the effective price of only $5. Even if you don’t care about smart tech stuff, getting a decent piece of smart home technology for $5 is well worth it to me. That’s not even the cost of a meal at a fast food joint. An American Express card with a targeted offer for $20 off a $50 purchase at Google Express. I don’t know how long this offer will actually last, so my advice – get in on this early while you can. In order to get in on this deal, you’ll first need to check your American Express account to see if you’ve received a targeted offer giving you a $20 statement credit after spending $50 or more at Google Express. Log into your American Express account and then scroll down to the bottom of your dashboard. You’ll see a section called Amex Offers and Benefits. Click the “Redeem Now” button and it’ll apply this offer to your American Express card. I had the offer on my American Express SPG personal card, but I didn’t have it on my American Express SPG business card. My wife had the offer on both of her American Express cards (a Delta Skymiles Blue card and a Blue Cash Everyday card). The offer itself is pretty straightforward and works automatically once applied – spend $50 or more at Google Express and you’ll get a $20 statement credit from AmEx. A Google Home Mini costs $49 without tax. With tax, your Google Home Mini should cost slightly more than $50. Make sure that your order costs at least $50 before tax. It seems like Google might waive your tax depending on where you live and the worst case scenario is that Google waives the tax after you put your purchase in, and then you find out that your total order is just barely under $50. You never want to risk anything with deals like this and it’s not a big deal to just add a small item to your order to take your total order over $50 before tax. I added a box of pasta to my offer that cost $1.38. The American Express offer is good through December 28, 2017, so you’ve got plenty of time to decide whether you want to use it. 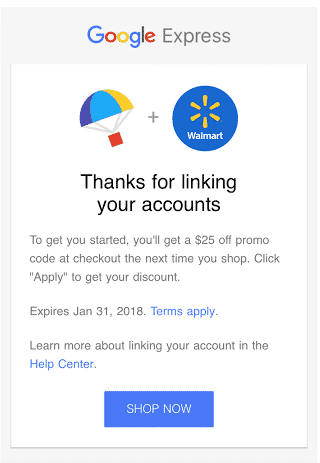 In addition to the $20 statement credit from American Express, Walmart is currently offering a $25 promo code for future purchases you make from Walmart using Google Express. You won’t be able to miss the promo (it’s plastered all over the main page of Google Express). You can also go directly to the promo page using this link. 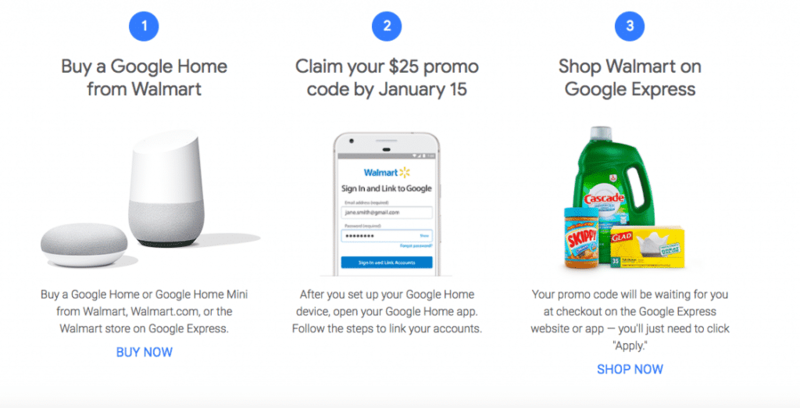 To claim the promo, all you have to do is buy a Google Home Mini from Google Express through Walmart, then link your Google Express account to your Walmart account by January 15, 2018. The Google app will walk you through how to do this. Once you do that, you’ll have $25 in credit that you can use to buy stuff from Walmart using Google Express. If you’re wondering what Google Express is, it’s basically just Google’s version of Amazon. You can just buy stuff that you need from Google Express and then they’ll ship stuff to you. In this case, you’ll get $25 worth of credit that you can use on Google Express for stuff from Walmart. Your $25 Walmart credit will be applied automatically. The $25 Walmart credit is limited to two per household, so if you have multiple American Express cards that have the $20 statement credit offer, you can actually buy two Google Home Mini’s for an effective price of $5 each. Just make sure you do it in two separate transactions using your two different American Express cards that have the $20 statement credit offer. I personally bought two Google Home Mini’s, linked them both to my Google Express account, and immediately had two $25 Walmart credits applied to my account. 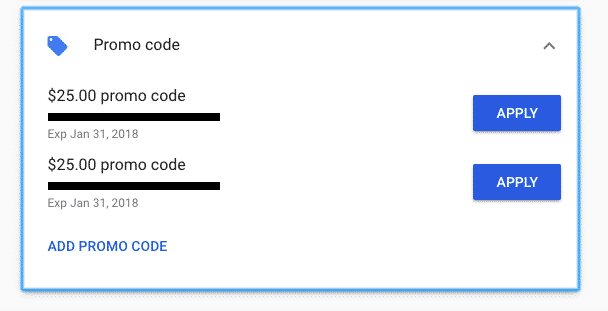 To use the $25 promo code, you just apply them at the checkout screen, under the section that says Promo Code. You have to use the $25 promo credit by January 31, 2018, which shouldn’t be a problem for most people. I’m planning to use my credit to buy groceries or something like that. I’m not sure when this offer will expire, and while the terms say that you can earn the $25 credit for any Google Home Mini that’s activated by January 15, 2018, I’d probably get it sooner than that just because you never know when a deal like this might go away. Check your American Express account to see if you have an offer for $20 in statement credit for a $50 or more purchase from Google Express. (make sure to activate the offer too). Buy your Google Home Mini from Walmart using Google Express. Link your Google Home Mini with your Walmart account (you might have to create a Walmart account). Your $25 Walmart credit will be applied to your account, which you can then use on future purchases. If you stack both of these deals, the effective cost of your Google Home Mini will be $5. The Google Home Mini costs approximately $50. You get a $20 statement credit from American Express. And Walmart gives you $25 in credits for a future purchase. That’s $50 you pay upfront, but $45 you get back in the form of statement credits or credits for future purchases that you’ll already make anyway. If you’ve never used Google Express before, you can also get $10 off a $40 or more purchase from Walmart if you use code GET10OFF40. In other words, you can get yourself $10 more of free stuff from Walmart – you just have to make sure that your total cost, after including that promo code, is still over $50. Personally, I think this deal is way too good to pass up. I’ve got two of them – one in my living room and the other one in my kitchen. It’s possible my house is TOO smart now. Hope this helps out those of you looking to get some smart home technology for your home. Hit me up if you have any questions or leave a comment below. What do you think? Are you going to take advantage of this deal? *Quick update: For Black Friday, the Google Home Mini is on sale for $29. That means that you could buy two Google Home Mini’s for a total cost of $58. With the AmEx offer, you’ll get $20 back in statement credit and you’ll get $25 in Walmart credit for each Google Home Mini. In other words, you’ll literally make a net profit of $12 with this deal! ($58-$20-$25-$25 = $12 profit). Hmm…I think as long as you’re linked that should be fine. I didn’t get any message asking me to link it beforehand. Let me know if it works out! Doesn’t that mean that “the man” will be listening all the time! Great post how much tech do you have in your house? I think Google’s listening to me all the time anyway – I swear that anytime I’m thinking of something, an ad for the thing I was thinking of pops up! It sold out by yesterday afternoon. I tried to grab more but it sold out as I inputed my credit card details. Target and Best Buy also has this pricing with $10 e-gift cards included. I ordered from Best Buy two of these and both are going to send e-gift cards upon shipping. I went ahead and bought mine from Best Buy , too! Bummer folks! I snagged them back before the Black Friday sales, so it hadn’t sold out then. I guess just another reason to jump on deals like this when they’re good – you just never know what might happen the next day. Hopefully, they come back in stock, which I expect they will after all the Black Friday/Cyber Monday madness. At that point, I think you should still be able to snag them for the effective price of $5 So keep an eye out to see if they get back in stock!